The Roxy kicks off a weekend of films for Fashion Week with a special screening marking the 20th Anniversary of The Fifth Element, Luc Besson’s cultural synthesis of science fiction and haute couture. The film was an epic platform for costume designer Jean Paul Gaultier, enfant terrible of 1990s fashion, to execute his craft at its full scale of grandiosity in a futuristic landscape of concert halls, luxury cruise ships, urban decay, and intergalactic warfare. The designer had already demonstrated his aptitude for the cinematic in Peter Greenaway’s masterpiece The Cook, The Thief, His Wife and Her Lover in 1989, as well 1995’s post-apocalyptic fantasy The City of Lost Children. But his artistry is here escalated to the proportions of apocalypse, and Big Hollywood budget. The film opens in Egypt 1914, where an archeologist and his protégé – graced by a cameo performance by Luke Perry of Beverly Hills 90210 – discover evidence of a recurring multi-millennial battle with evil recumbent on four mystical stones, and their Fifth Human avatar, preserved by a sacred priesthood. It then flashes forward to 2263 New York, where the avatar is synthetically generated in a laboratory in the form of the pneumatic Leeloo (Jovovich) who escapes into the taxicab of retired soldier Korben Dallas (Willis). Abetted by a priest of the ancient brotherhood, the pair take on a mission to obtain the sacred stones let they land in the clutches of corrupt business mogul Zorg, played by a hypercolor plastic-clad Gary Oldman with a histrionic Southern drawl. Chris Tucker establishes himself into Hollywood stardom in this film with his portrayal of flamboyant fast-talking radio personality Ruby Rhod – and pretty much makes the film in the process. 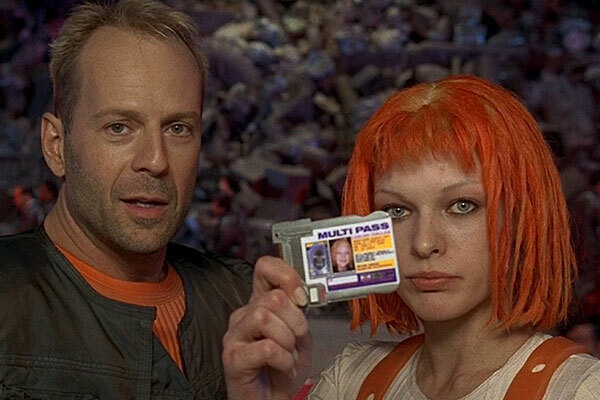 The Fifth Element was a cultural emblem of its time and major box office success for a film of French origins, grossing $263 million. The production design was inspired heavily by 90’s rave culture, and nods further to electronic music with an appearance by trip-hop idol Tricky. It marks an era where movies, subcultures, and high fashion coexisted harmoniously. In a sharp contrast to our current times, the late 1990’s endorsed a code of conduct where being ordinary was unacceptable with the prevailing trends. Secret parties and underground music engineered a generation with a thirst for the esoteric. The imminent dawning of cyber-space lured the imagination with fantasies of the limits of human potential and the seemingly infinite possibilities for the extension of style and taste. If the elapse of twenty years since the release of the film have failed to live up to the creative optimism of Generation X, Besson and Gaultier have definitively enshrined its legacy with their macrocosmic creations in the magnitude of The Fifth Element.